Growing in Grace Podcast: 677. 1 John 1:9 (Part 1) Was John Addressing Believers or Unbelievers? 677. 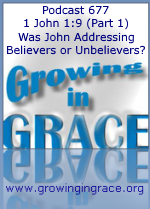 1 John 1:9 (Part 1) Was John Addressing Believers or Unbelievers? Regardless of your Christian background, there is a good chance the Bible verse that you've heard quoted or used more than any other is 1 John 1:9. “If we confess our sins, He is faithful and righteous to forgive us our sins and to cleanse us from all unrighteousness” (NASB). Generally, “the Christian religion” has put a spotlight on this verse by jumping to the conclusion that believers in Christ should continue to apologize to God by confessing every sinful thought or action in order to remain in God’s perfect way of forgiveness. As they see it, failing to do so will result in having unforgiven sin in your life and put a strain on your fellowship with God. 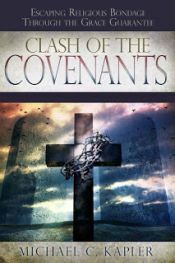 It’s as though God’s grace and the finished work of the cross are set aside on the shelf, as you are burdened with trying to confess what God declared He remembers no more and is not counting against us in this New Covenant. *This will be a multi-part series that will unfold more clearly over several weeks.